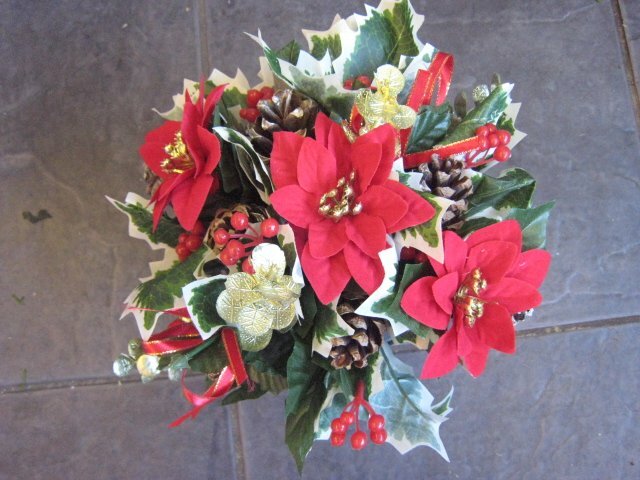 During Winter months silk floral cemetery pots are a popular choice. 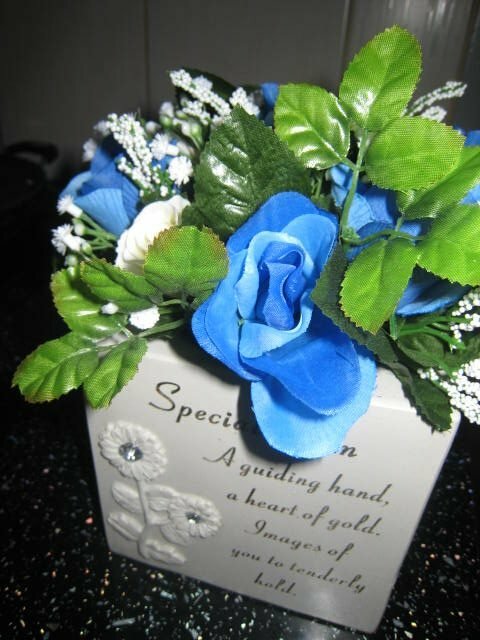 These cemetery pots are ideal arrangements for placing on a grave for a long lasting tribute. 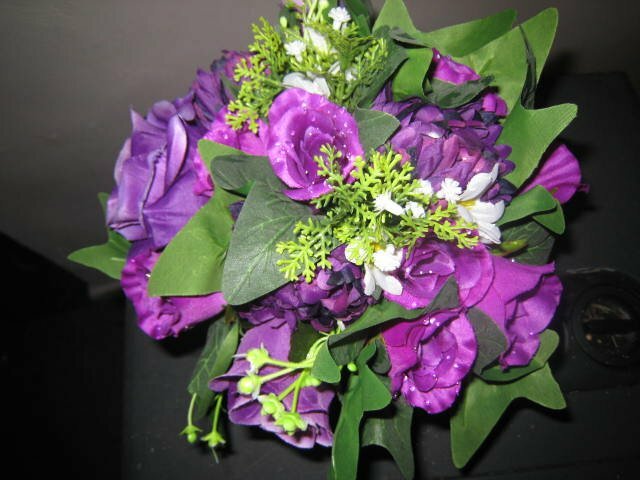 We use only the best silk flowers that look just like the real thing. 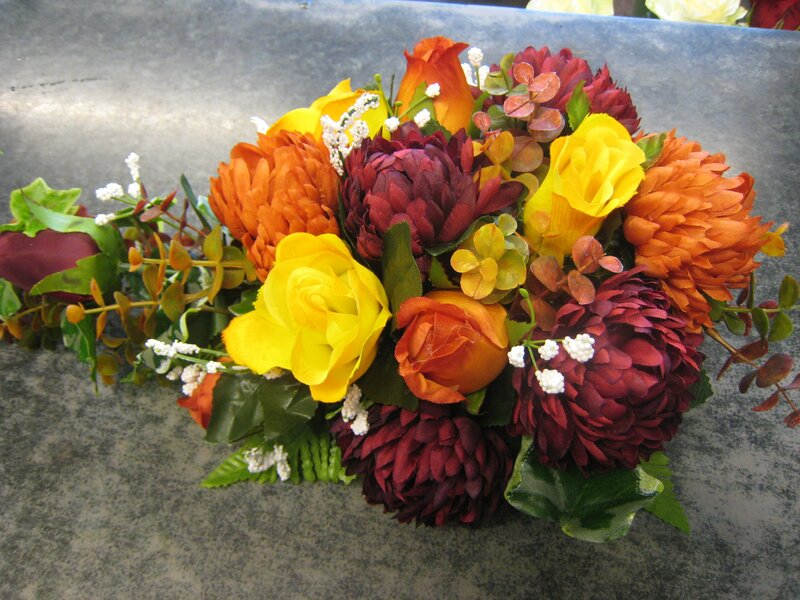 Silk Flowers come in a wide array of colours and flowers similar to fresh flowers. 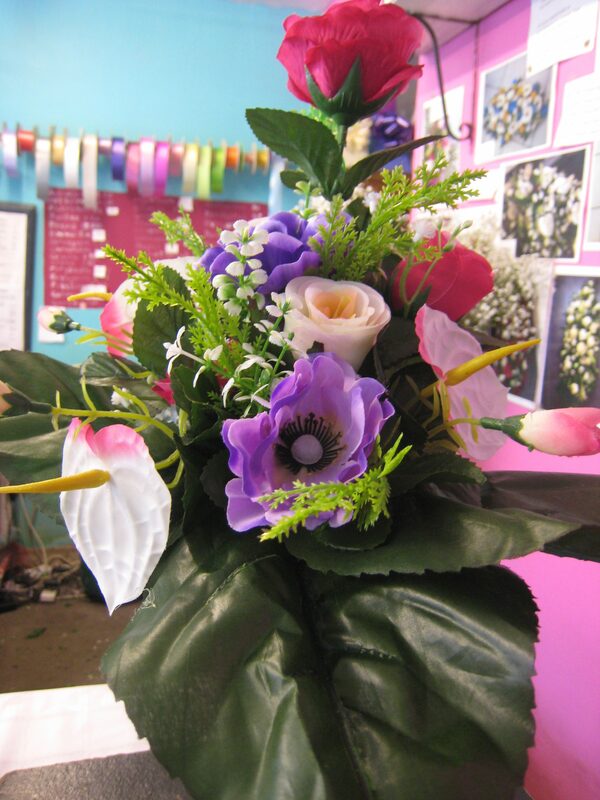 If you require something special just call us and we will do our best to source it for you. 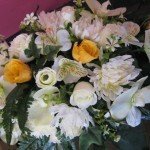 If you wish us to post your arrangement please allow a few days notice. 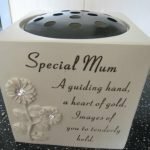 Each design is arranged in a black plastic round cemetery pot or if you prefer we can also do them in silver metal ones for an extra cost. 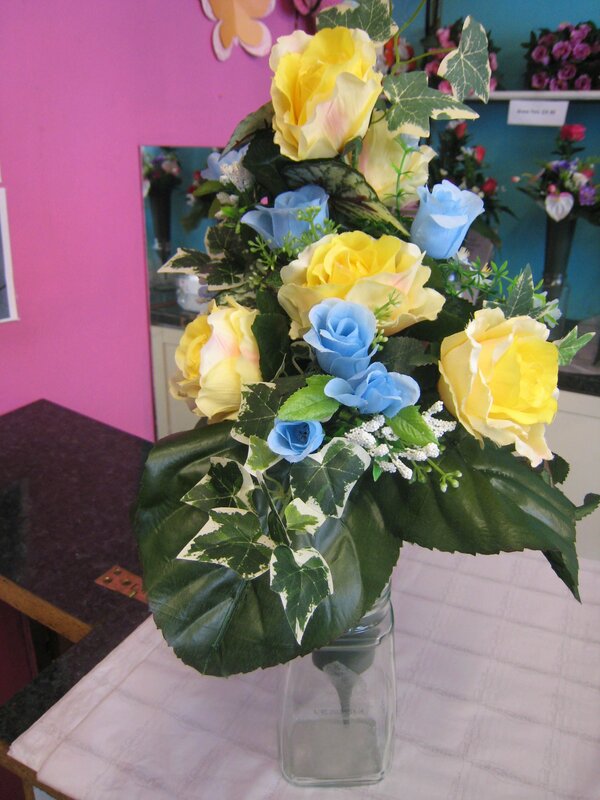 You choose the colour palette and let us arrange them for you. 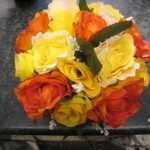 We also re-do your old ones if you bring them into our shop. 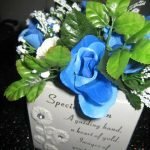 These cemetery pots can be sent by Royal Mail anywhere in the UK. 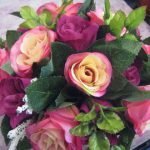 As postage cost are regularly changing we only take card payment once we have weighed the item. 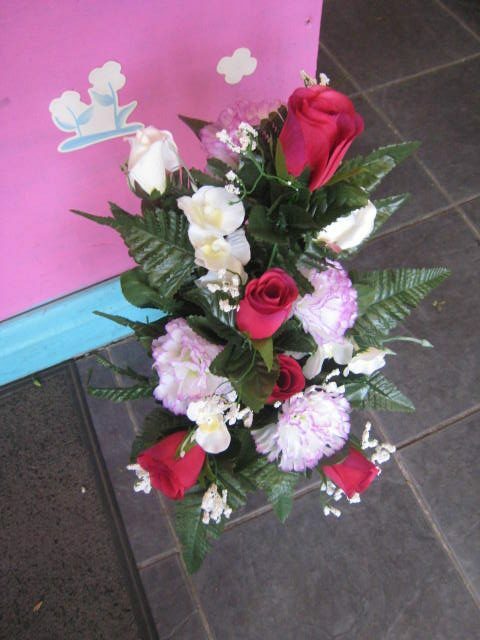 We can also send by 1st class post just mention which you prefer. 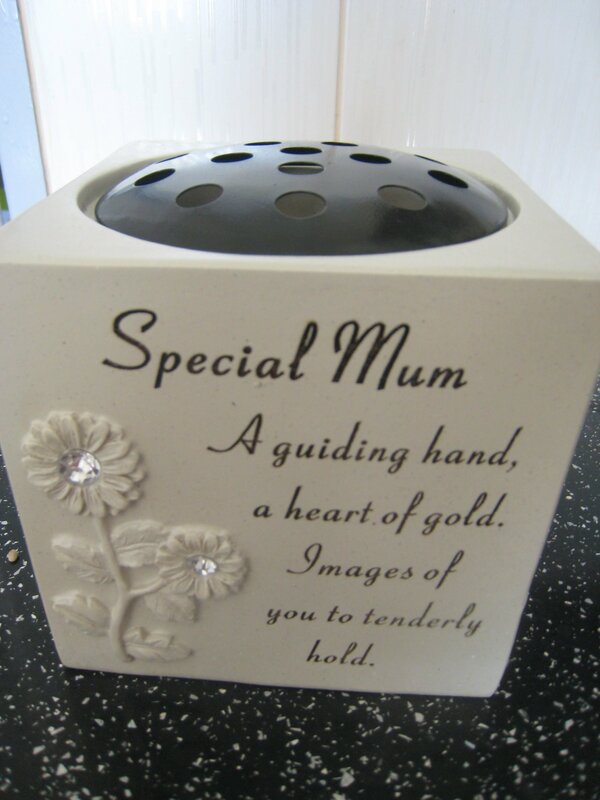 We have just been asked to make a special grave pot in a Mum cream pot as shown. 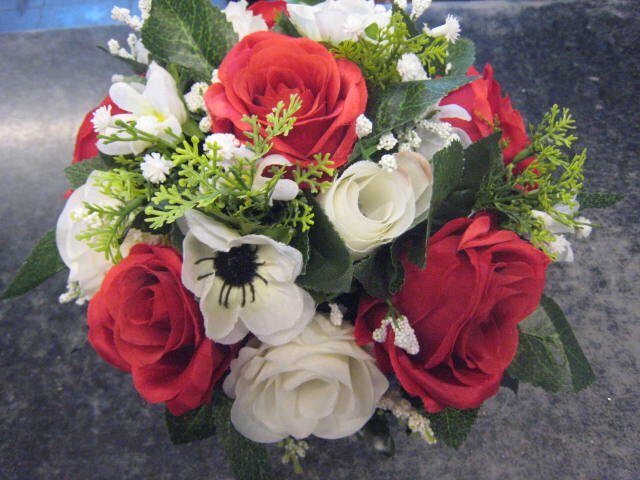 These can be made in any colour of silk flowers but the pot and the verse cannot be changed. 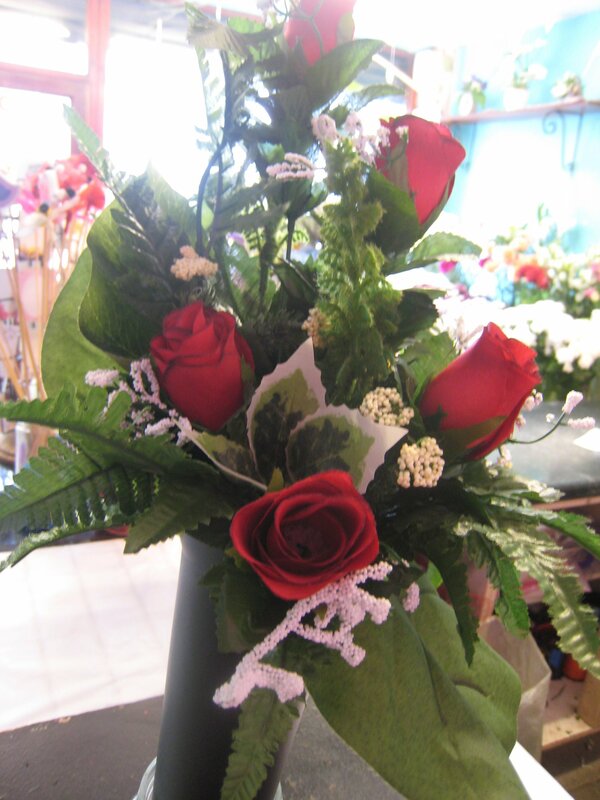 The lid comes off so the flowers can be taken out and fresh ones inserted. 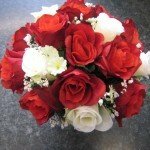 These can be ordered and posted out anywhere in the UK but must be ordered in advance. 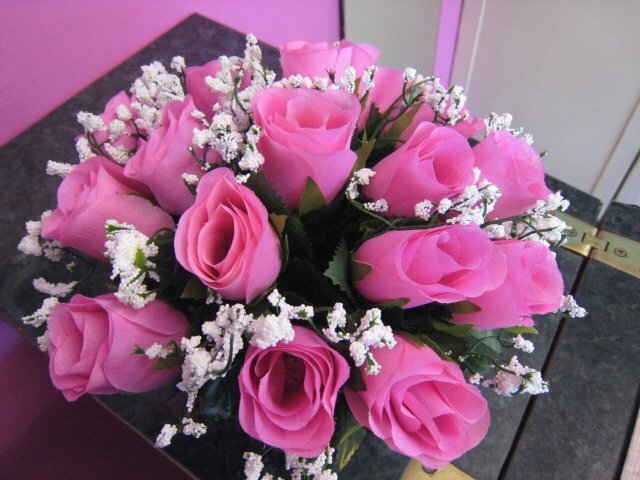 images of you to tenderly hold. 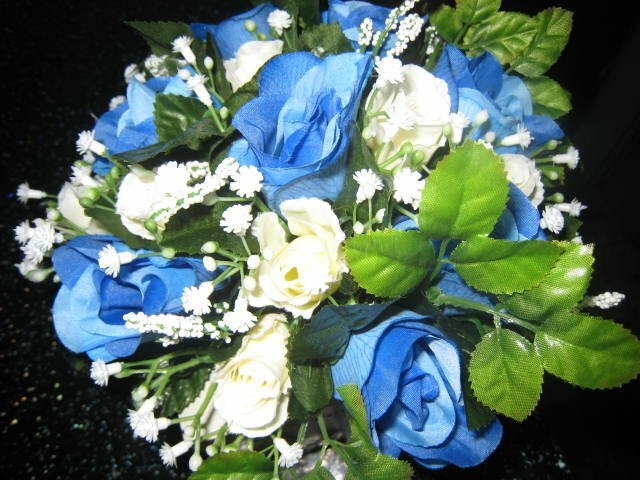 This is the pot filled with the blue and white roses and foliage. 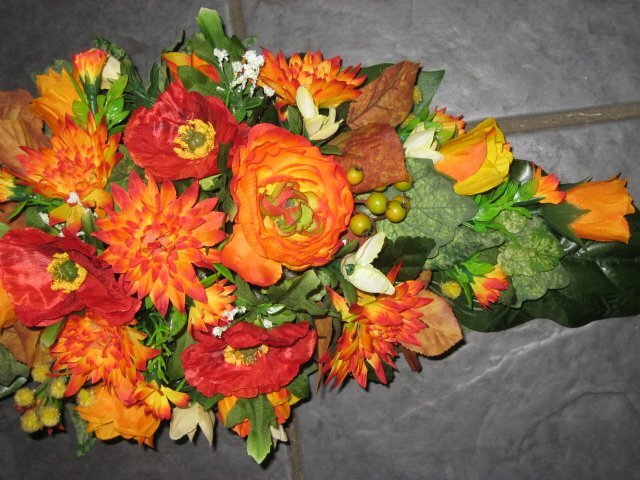 Here are just a few of our more recent ones…. 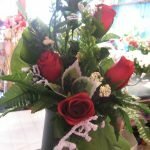 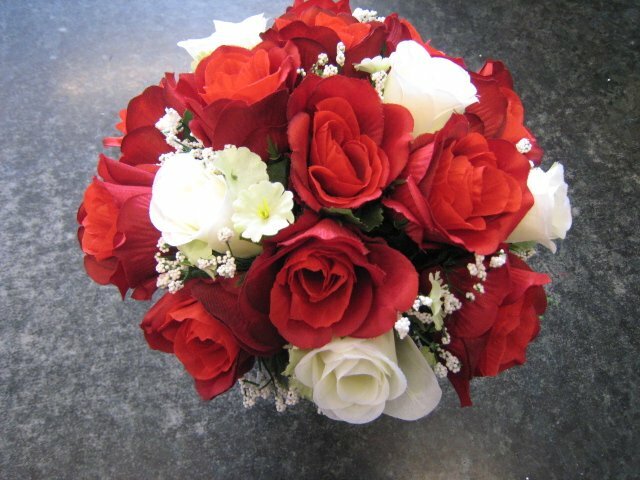 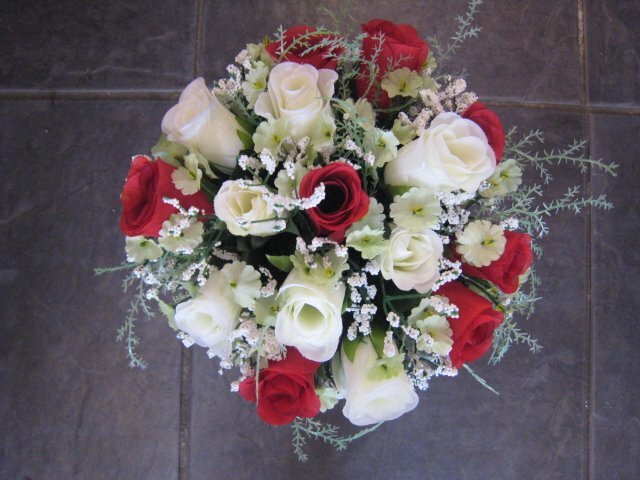 We can make to your requirements either a few white roses and more red or more red roses and a few white roses. 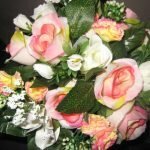 Flowers are subject to availability and are constantly changing, so some pots may not be available in specific colours depending on stock. 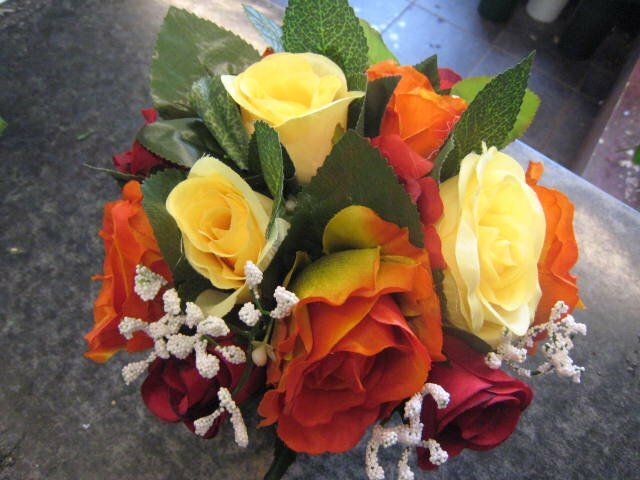 Pale yellow roses and foliage with 5 orange roses. 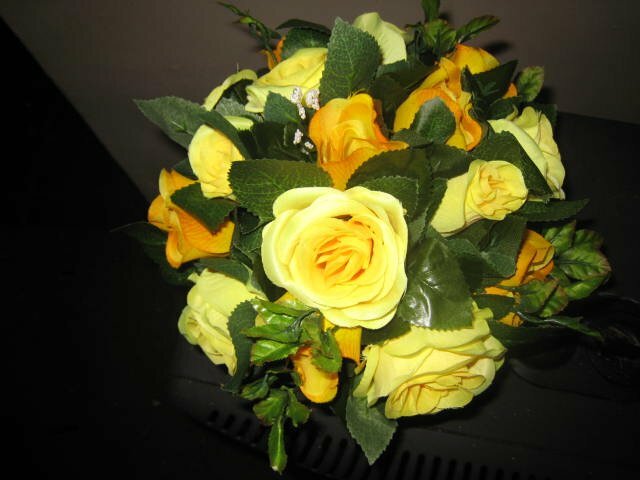 PALE YELLOW ROSES UNAVAILABLE AT THE MOMENT ONLY DEEP YELLOW. 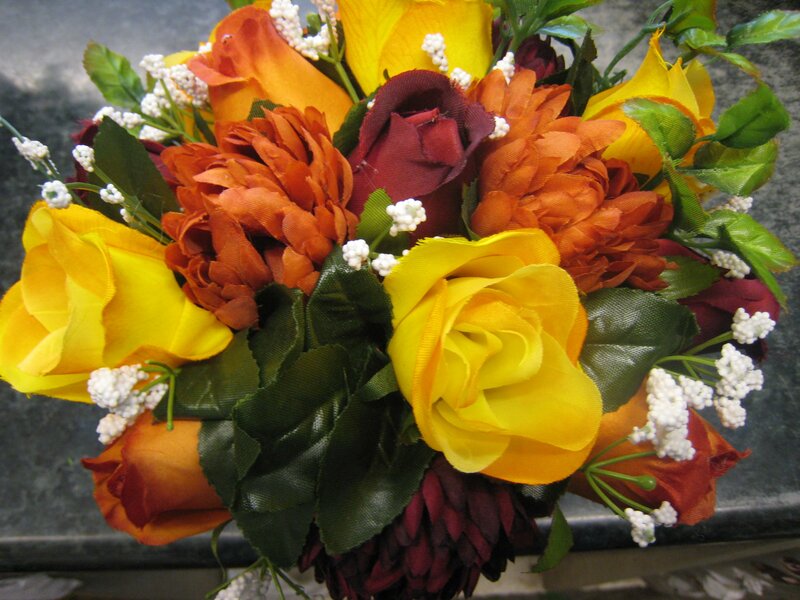 An assortment of yellow and orange roses with gypsy and rose leaves. 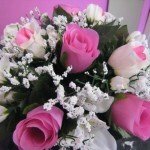 Pale pink roses edged with white and white roses and sprigs of gypsy and foliage in a pot. 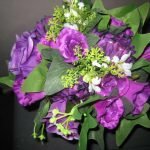 Deep purple roses and sprigs of white flowers and foliage in a pot. 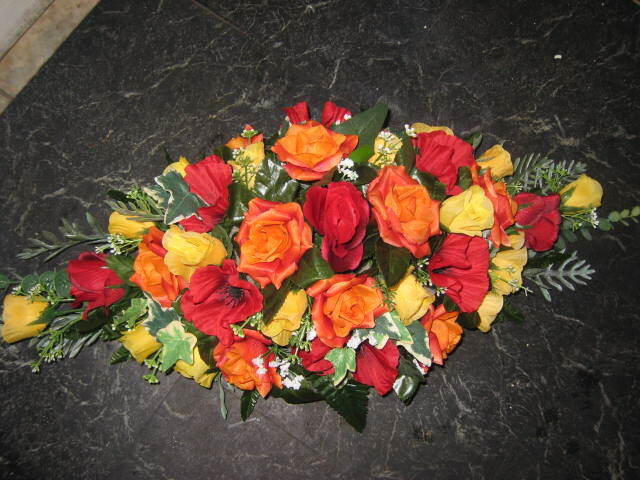 Bright orange, yellow and red roses arranged in a cemetery pot. 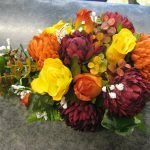 A very popular pot for Autumn months. 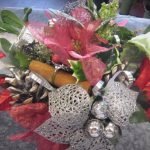 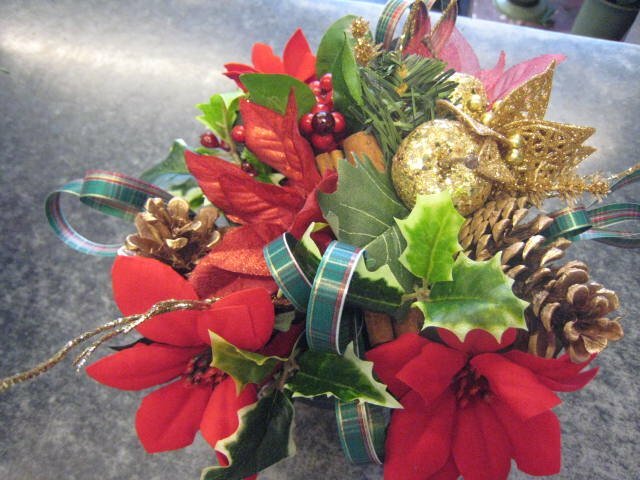 As Christmas stock is now in some autumn flowers may be limited and subject to change. 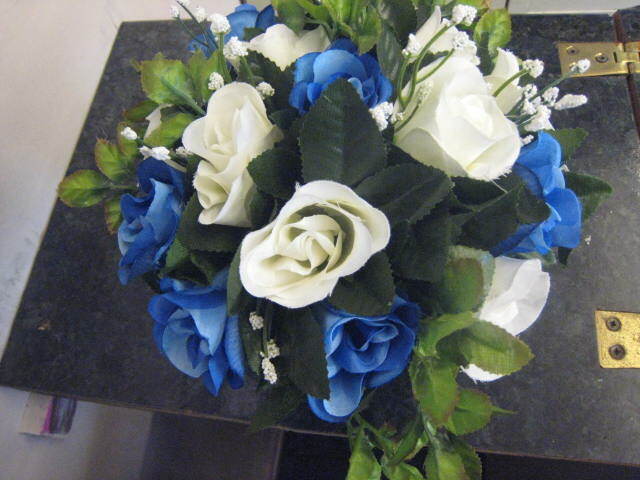 An assortment of white and blue roses with gypsy arranged in a pot. 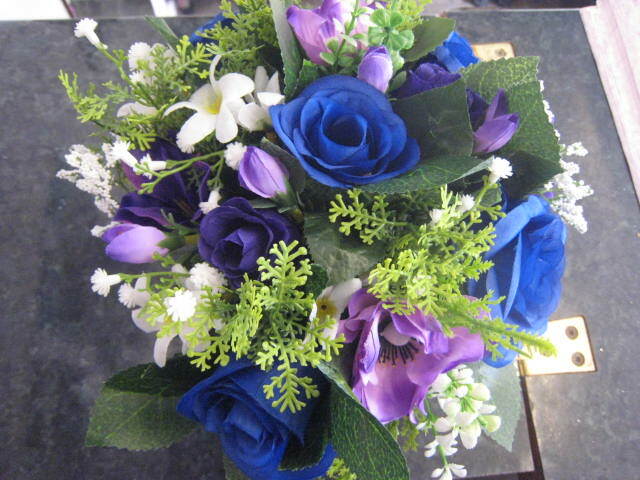 Bright royal blue roses and deep purple and lilac flowers all arranged with a touch of white in a cemetery pot. 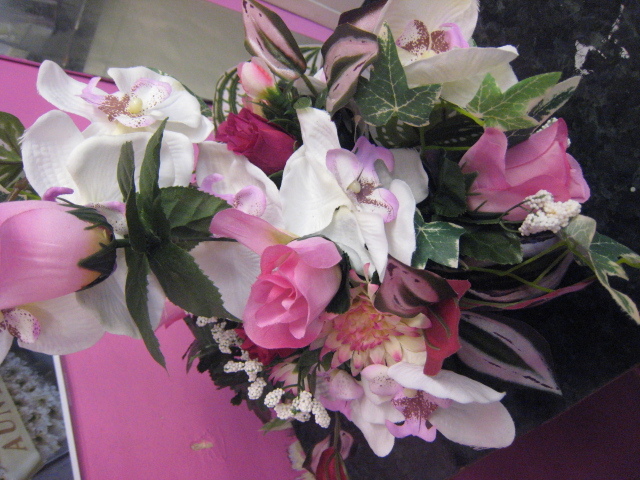 We can also make your flowers in a grave vase spike if you prefer for the same price as a pot. 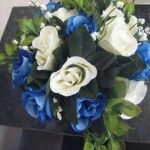 Just tell us which colours and we can make to your requirements. 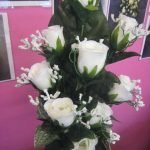 These are a plastic vase with a spike at the bottom which can be inserted directly into the ground. 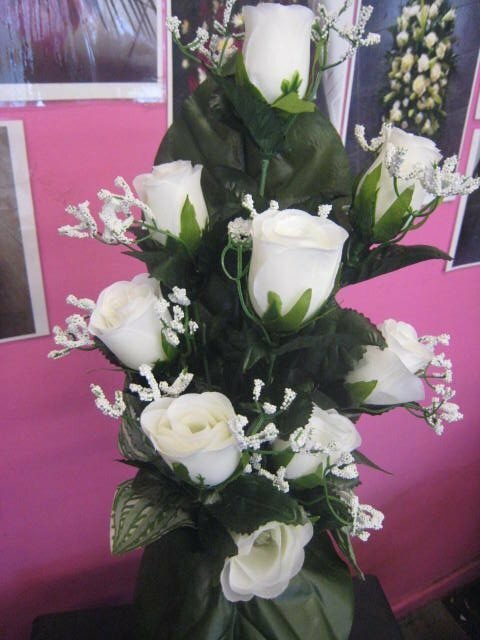 The length of the spike without flowers is 13 inches. 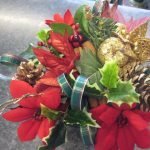 These pots can be made with red poinsettia or silver/white flowers, holly, pine cones and sparkly christmassy bits with christmas ribbon. 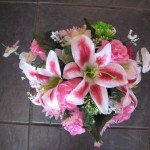 Each pot is made individually so may be subject to stock availability. 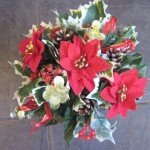 Please order from November onwards to ensure delivery before Christmas. 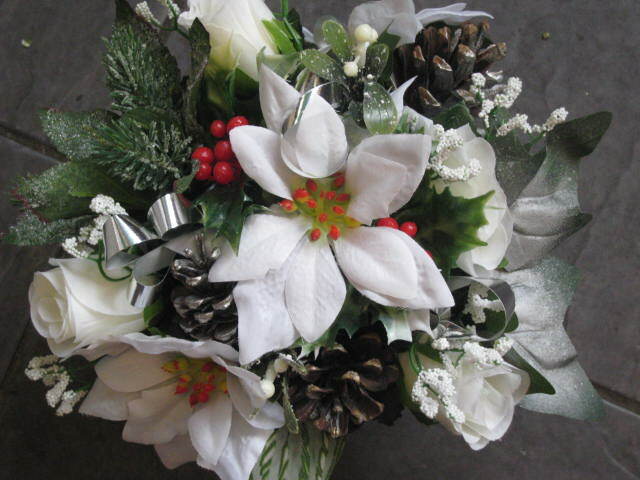 As December is really busy for us try and order as early as possible. 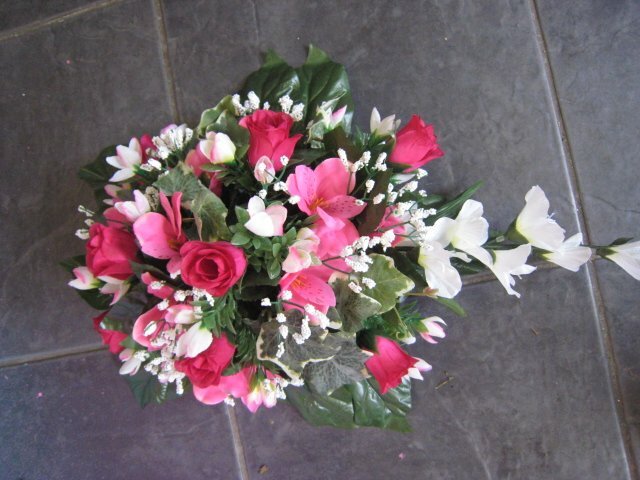 This arrangement is in a round pot, made slightly taller and wider to sit against a headstone. 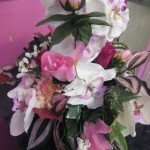 The flowers used are pink roses, orchids, gypsy, chrysanthemums and foliage. 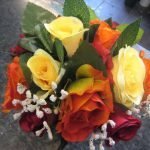 Other colours are available. 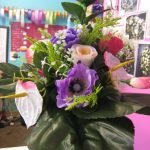 Flowers may change due to availability. 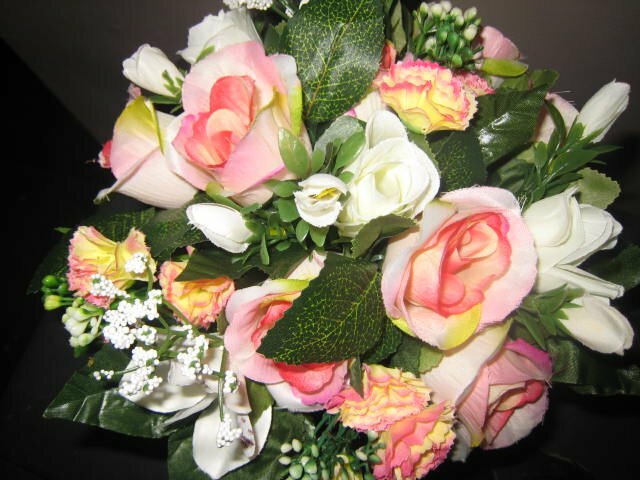 A selection of pink edged roses and cerise roses and gypsy with leaves arranged in a round pot. 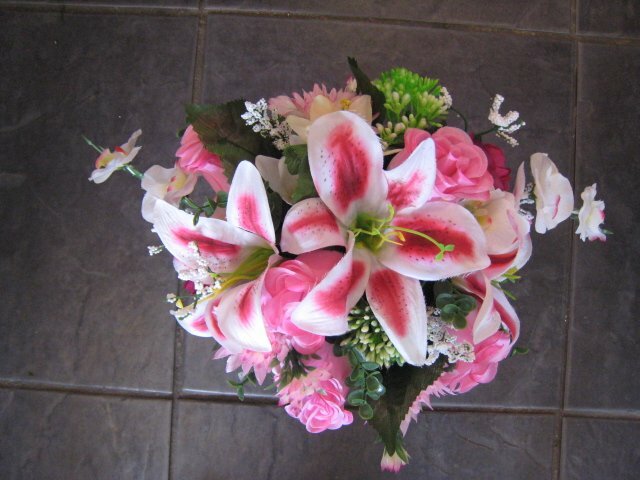 A selection of stargazer lilies, roses and a touch of white flowers in a round pot. 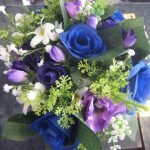 We will be adding more of our new pots soon….but feel free to email or call us for specific colours and we will do our best to get them for you. 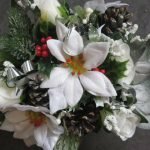 Some of the flowers are not available due to the christmas stock arriving into the wholesalers but alternative colours may have to be used. 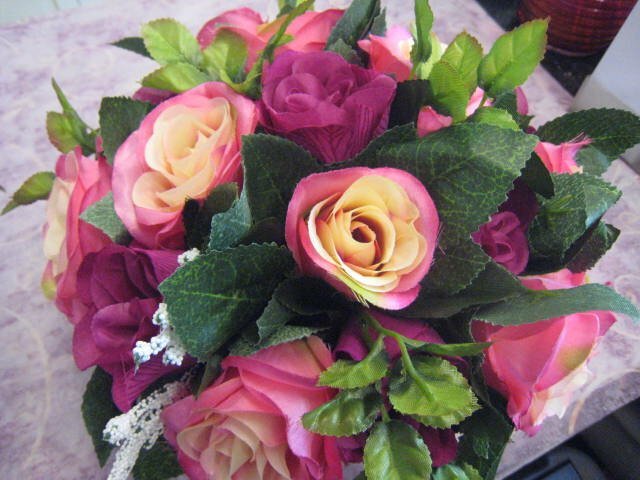 Bright pink roses with gypsy all arranged in a grave pot. 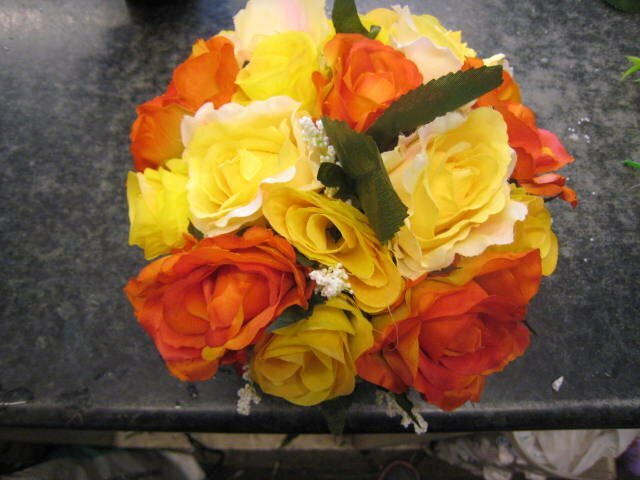 This can also be made in yellow, blue, white, orange or red roses. 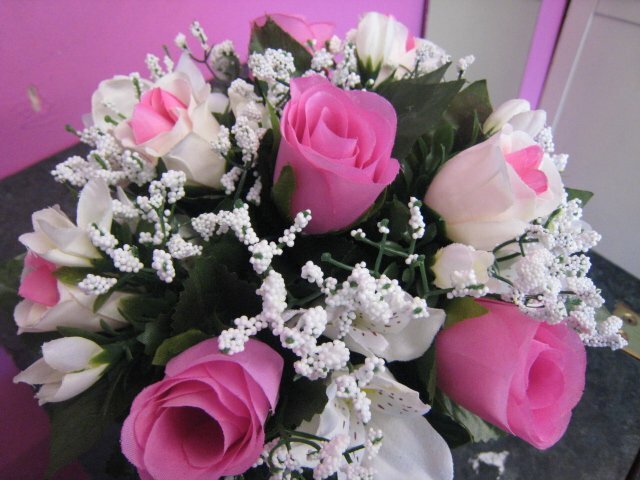 An assortment of pink roses, white roses with a touch of pink and white alstromeria and foliage. 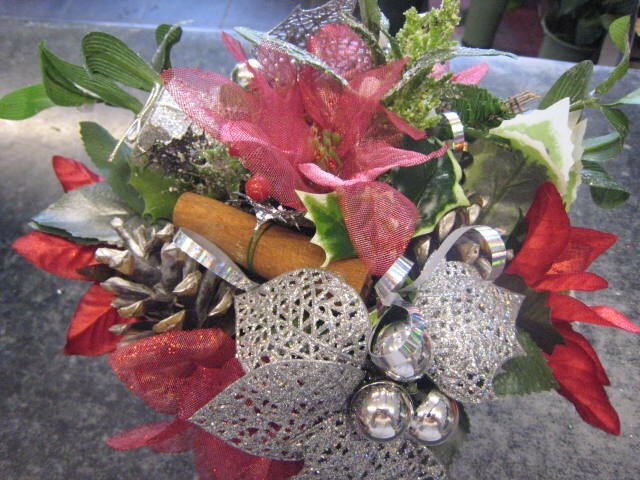 These have been individually designed for our customers. 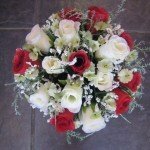 They are priced individually starting from £27.00 for a teardrop and £40 for a double teardrop, depending on the size. 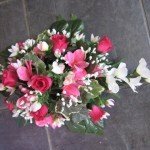 An alternative to the round grave pot is a single ended design (in the shape of a teardrop). 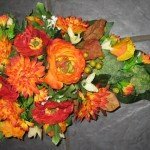 This can be made in a wide array of colours just like the flowers in the grave pots. 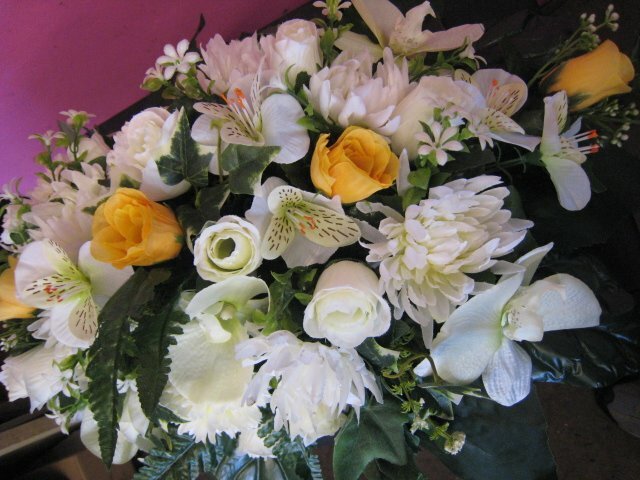 This one was made to specific measurements and includes a large selection of white flowers with a touch of yellow. 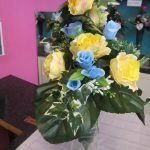 Please give us a call to order 01942 606666. 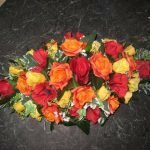 Please give us as much notice as possible if you would like your order posted to you so that we can make to your specific requirements. 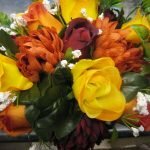 Our phone line is open 9-7pm most days or you can leave a message on our answerphone. 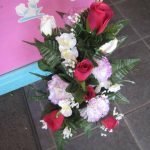 Remember we always answer our emails even when our business is closed for the day. 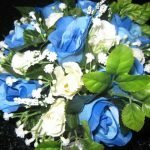 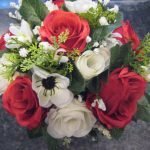 Because of the wide range of silk flowers available on the market we will endeavour to meet your requirements if you wish us to make certain colours or flowers just ask when you order.